This gorgeous recipe works just as well as a speedy midweek dish for 2, as it does cooked for friends at a dinner party. 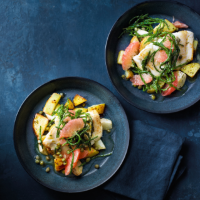 Pink grapefruit, samphire and capers combine to add freshness and piquancy to the dish. Pair with a zesty coastal white wine, such as the deliciously refreshing Waitrose & Partners Vina Taboexa Albariño, Spain. 1. Preheat the oven to 220°C, gas mark 7. Toss the diced potato and turnip with ½ tbsp oil, the garlic and rosemary, then season and scatter in a roasting tray. Roast for 25-30 minutes, stirring halfway. 2. Meanwhile, slice the top and bottom off the grapefruit. Using a sharp knife, slice downwards around the grapefruit, following the curve, to remove the skin and pith. Finally, holding the grapefruit over a bowl to catch any juices, slice between the connective membrane to release the segments. Chop the segments and mix with 3-4 tbsp of the juice. 3. Heat the remaining ½ tbsp oil in a non-stick frying pan over a medium-high heat. Season the haddock fillets and fry for 2½ minutes on each side. Set aside on a plate. Add the butter to the pan, then stir in the shallot. Add the samphire and 1 tbsp water and fry, stirring over a medium heat for 3 minutes. Stir in the capers, remove from the heat and carefully stir through the grapefruit and juice. 4. Divide the roasted vegetables between 2 plates, top with the haddock fillets, then spoon over the grapefruit salsa. Speed things up with a pack of parmentier potatoes rather than preparing your own potatoes and turnips.